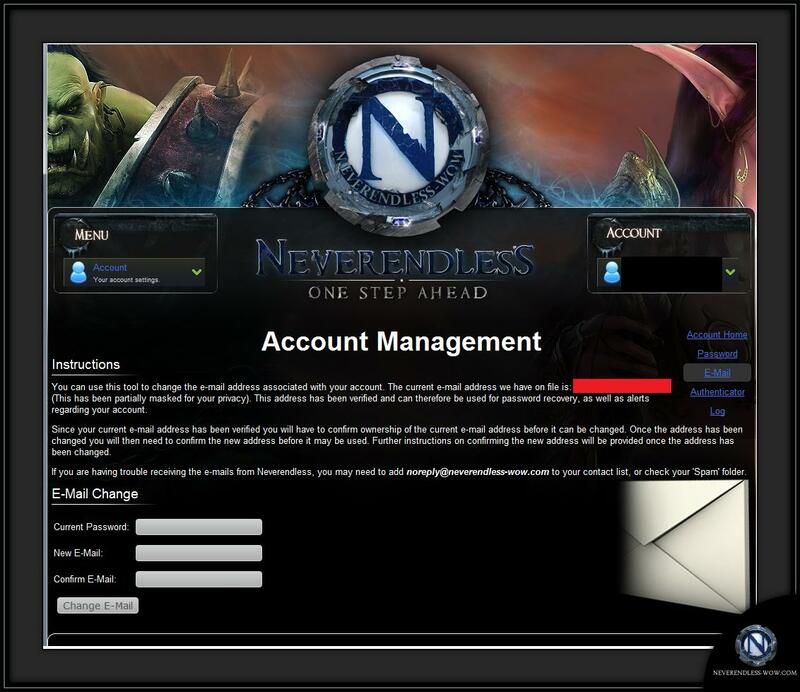 Are you trying to change your game account Email address? We will assume you have already verified your email address for this guide. 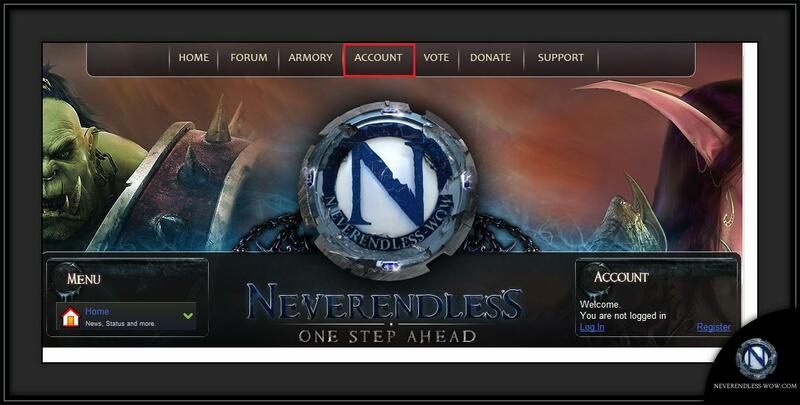 If you have not then please read the Access to your account has been disabled guide first. 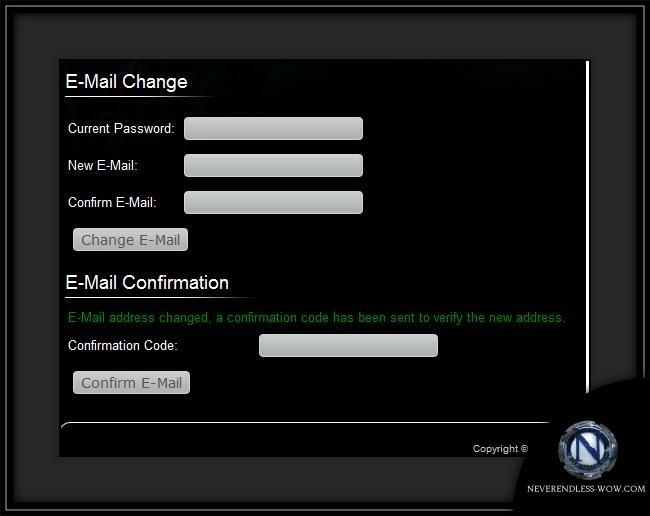 To change your email you will need to sign into the website with your current username and password and go to the Account Page. Here you will want to click <E-Mail> on the right of the page. This will bring you to the Account Management - E-Mail Change page. 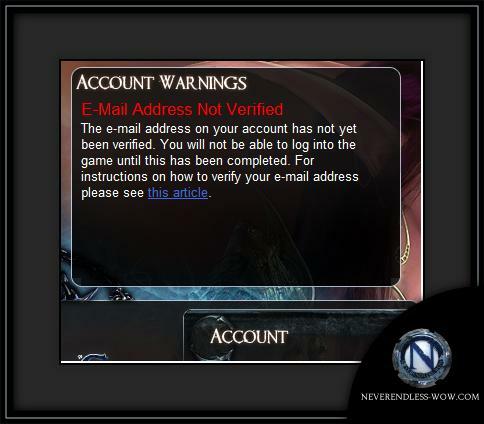 On this page it will tell you what the current E-mail on file is for your game account. As it will be partially masked for your privacy you will only see the first letter and the end of the email but this should hopefully be enough for you to figure out which email is currently being used on this account. 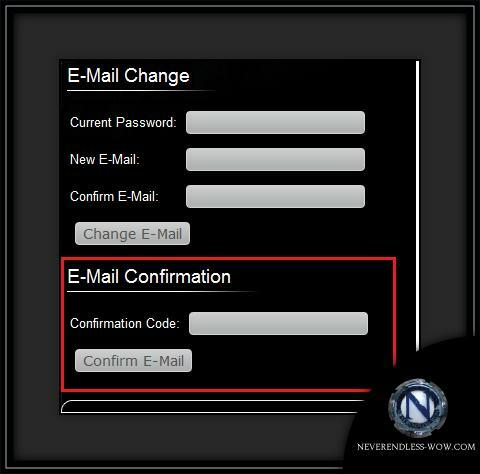 First enter your "Current Password" then enter your "New E-Mail" and retype your new email choice in the "Confirm E-Mail" box. Now click on <Change E-Mail>. 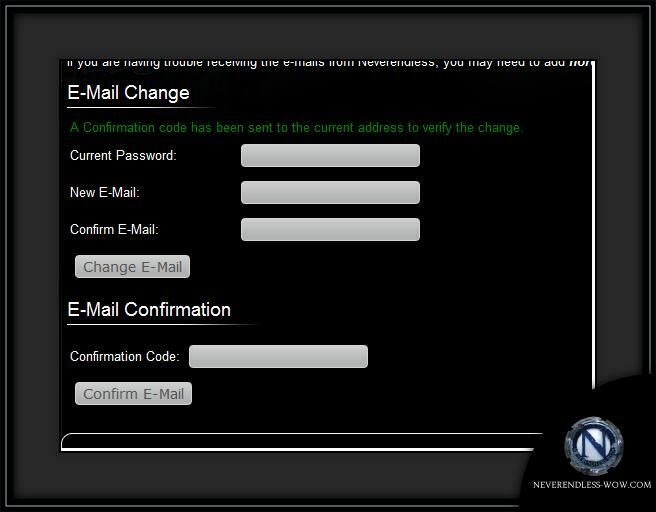 Telling you to get your Confirmation code from the email sent by Neverendless. This is an automated message regarding your account at Neverendless WoW. A request was received to change the e-mail address of the account above to XXXXXXXXXXXXX. If you made this request, then you may confirm it within 24 hours by entering this code: ########## into the e-mail section of the account management panel on the Neverendless Website at https://www.neverendless-wow.com/account/email/ . If you did not request this change then we would advise you to change your password immediately as your account may have been compromised. 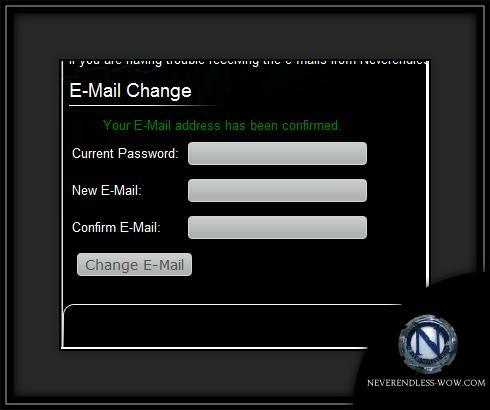 This will cause a message to appear saying that the email address has been updated to the new address and there will be an email from Neverendless sent to the new email address with a new confirmation code to verify the new address is valid. Fear not as this is just a warning message to tell you that until you finish the email change process, by confirming your new email choice, you will not be able to log into game. This is an automated message regarding your account at Neverendless WoW. 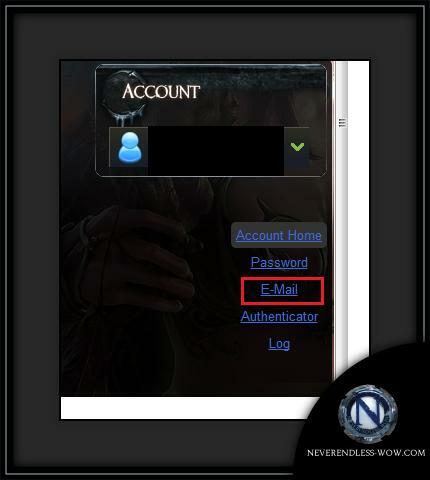 A request was received to confirm that this e-mail address belongs to the owner of the account above. If you made this request, then you may confirm it within 24 hours by entering this code: ######### into the e-mail section of the account management panel on the Neverendless Website at https://www.neverendless-wow.com/account/email/ . If you do not own the account above then you can safely ignore this message, we will not send any further e-mails to this address without confirmation. If the account above does belong to you and you did not request this confirmation then we would advise you to change your password immediately as your account may have been compromised. This will cause this message to appear saying that the email address has now been confirmed. Your Email address is now all changed, confirmed and you can go play.